Canoe hire in London. Canoe and Kayak the Thames, based in Shepperon, are one of several places you can hire a kayak or canoe in London. Kayak and canoe hire in London is available from several commercial outlets. Most clubs and centres will have their own stock of boats, but these will be reserved for the use of their members and will not be available for public hire, unless you attend an event at the club or centre. In central London, Moo Canoes provide canoe hire and kayak hire from their base at Limehouse, as well as guided tours on the Thames. From Limehouse you can spend a day exploring a circular route around London’s canals, or you can do a shorter ‘out and back’ trip along the canals. In the west of London, canoe hire is available from Canoe and Kayak the Thames and Thames Canoe Hire. Canoe and Kayak the Thames is run by the friendly staff from London’s longest established canoe and kayak shop, Whitewater The Canoe Centre, and can be found at Shepperton Marina, close to the river Thames in Shepperton. They provide kayaks, sit on tops and canoes for hire. Thames Canoes is based further west, on the outskirts of greater London, and provides open canoes for hire, for single or multiday use on the River Thames. 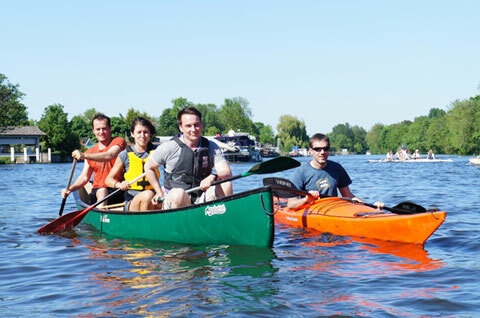 To the north of London, Lee Valley Canoe Cycle is based in Broxbourne and provides kayaks and open canoes for hire, as well as providing guided canoe trips on the River Lee. In central London, Kayaking London, London Kayak Tours and Moo Canoes all provide guided kayaking and canoe trips. Experienced paddlers can also hire ‘demo’ boats from Whitewater The Canoe Centre.